Distillation is one of the primary alchemical processes used in the production of true spagyric extracts. The 2 primary methods of distillation used are for essential oils, which extracts the Sulfur (Soul) of the plant, as well as for alcohol, which extracts the Mercury (Spirit) of the plant. 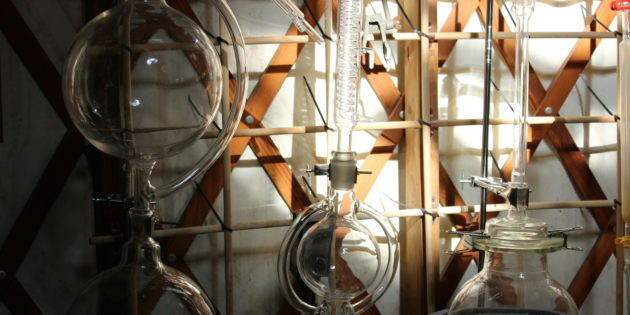 The process of distillation can be seen as a way the alchemists reflected the pattern of nature within their work, specifically in regards to the nature of the Water Element and how it flows through nature. In fact, we all see distillation happening all around us all the time! A great example of this is when you go camping and are sleeping in your tent. If it’s cold outside at night, the contrast between the cold temperature outside, as well as the warmth of your breath inside the tent causes the water vapors to condense and turn to liquid on the inner walls of the tent. Or on a larger scale, when the Sun heats up water on the ground, causes it to evaporate up into the sky which then gradually cools and condenses into clouds and rains back down onto the Earth. These are all examples of distillation as it occurs in nature. It’s critically important to understand that all alchemical works are based on what nature is already doing! The alchemists directly perceived the intelligence of the natural world and all of her cycles, patterns and rhythms of change and transformation, and took that wisdom into the lab and used it to create their living medicines. And because the medicines are prepared through these universal patterns of transformation in nature, they contain this innate quality of transformation within them, and thus convey that quality to us when we ingest them. Distillation is a process of taking a liquid substance, be it water or alcohol, and heating it up to the point of it vaporizing into steam. This process of taking something from a liquid and turning it into vapor is called volatilization, which symbolically is seen as taking a physical material and “spiritualizing” it, or sending it up and out into the Heavens. As this invisible vapor rises up in the upper portions of the still it is receiving all of the subtle energetic influences occurring in the sky at that moment. This is because the still is a microcosm of the macrocosm. Thus, whatever astrological influences are occurring at that moment in the macrocosm are directly being imprinted into the microcosm of the upper world, or Heaven, of the still. This is one primary way that celestial qualities are harvested in alchemy and embedded into the medicines being prepared. From here, this spiritual vapor (again usually alcohol or the essential oils of the plant) is cooled, which allows it to condense from an invisible, volatile substance down into a more fixed liquid substance. It then drips down the condenser and is collected in a vessel, concentrated, purified, and infused with the subtle qualities of the astrological dynamics occurring at that moment of distillation. This is but one of many processes used in spagyric medicine making that is rich with symbolic meaning as well as incredibly potent on the biochemical level, as the wholeness of the plant is truly embodied and concentrated in various ways. In this way, because the wholeness of the plant is present in the medicine they will act upon the wholeness of the person in the way that they heal.